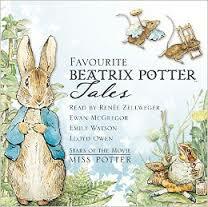 Join Peter and other familiar Beatrix Potter friends in brand new adventures! 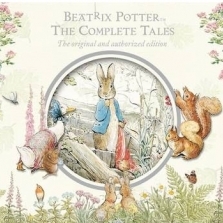 In The Further Tale of Peter Rabbit, Peter ventures beyond Mr McGregor’s garden all the way to Scotland where he meets his distant cousin Finlay McBurney and takes part in some Highland rabbit Games involving a very, very large radish. In The Christmas Tale of Peter Rabbit, Peter and his cousin Benjamin Bunny must step in to save their friend William – a turkey – from ending his Christmas on Mr McGregor’s table! Finally, when a carnival comes to town in The Spectacular Tale of Peter Rabbit, Peter gets swept up in all the fun of the fair and finds that little girls can really be quite dangerous. 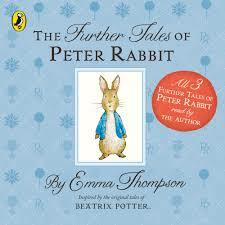 Collected for the first time in audiobook, these three Further Tales of Peter Rabbit, by award-winning screenwriter, actress and national treasure Emma Thompson, are a perfect gift for ages 4 and up.